It’s that time of year where the leaves change color, the air has an undercurrent of coolness and the mornings are crisp and clean. It’s a beautiful time of year, but with that also comes the rain. 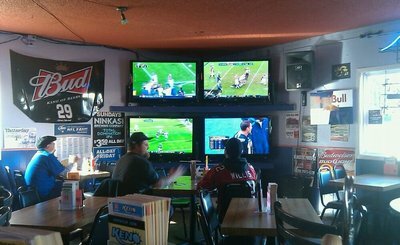 The rain frustrates some, but Greeley Avenue Bar & Grill is still you’re steady place to go offering a number of sports on their TVs, wrapping you in warmth, serving hot food while you dry off from the rain, great choices of beer and other delicious beverages. Deshurtes Twilight offers a light, but full-flavored aromatic Ale. This beer pours golden orange with a thick white head and nice lacing, citrus hops, lemon peel, and sweet malt. It’s a well-balanced flavor slightly on the sweet side. It offers an ABV of 5%. Just don’t forget those are subject to change when they run out, so grab them while you can! Welcome and thank you to all the new subscribers! Have a great week and we’ll see ya there! This entry was posted in Entertainment and tagged & grill, angry orchard cider, beer, Fall in Portland, Fat Tire, football, Hop Trip, Lagunitas IPA, NFL, NFL schedule, Ninkasai IPA, Oregon brews, Portland Oregon Restaurants, sports bar & grill, things to do in Portland by greeleyave. Bookmark the permalink.